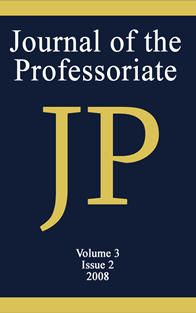 The Journal of the Professoriate (JOTP) is an international, refereed, and scholarly journal that seeks to promote lively discourse among scholars and policymakers on various issues affecting all college and university faculty in higher education in America and abroad. The primary mission of the Journal of the Professoriate is to provide an outlet for critical analysis and scholarship on issues pertaining to the pathways leading to the professoriate as well as all issues about and relevant to college and university faculty within academe and the global society. Annuals of the Next Generation (ANG) is a refereed, scholarly journal that provides a venue to showcase the next generation of scholars of color, by publishing the research of graduate students. ANG highlights research from multiple disciplines and areas, and allows these young scholars to present their work to an international audience. ANG is an open-access journal. Journal of Progressive Policy & Practice (formerly the Policy Briefs) features peer-reviewed articles that provide empirical data to inform policy makers at all levels (e.g., institutional, state, and federal) of urgent and current problems that affect the African American community. Ultimately, these articles will lead to the adoption of the preferred alternative or course of action outlined, and therefore serve as an impetus for action.